American rabbi; professor of rabbinical literature and philosophy in the University of Chicago; born in the grand duchy of Luxemburg May 22, 1852; educated in the public schools of the duchy and in the University of Pennsylvania. When his father, Samuel Hirsch, was called (1866) to the ministry of the Reform Congregation Keneseth Israel, in Philadelphia, Pa., Emil accompanied him to the United States, continued his education at the Episcopal Academy in Philadelphia, and graduated from the University of Pennsylvania in 1872. In that year he went to Germany and studied at the universities of Berlin (1872-1876) and Leipsic (philosophy and theology; Ph.D. 1876); he also attended the Hochschule für die Wissenschaft des Judenthums. On his return to America he was elected rabbi of the Har Sinai congregation at Baltimore, Md., in 1877. A year later he accepted the rabbinate of the Adas Israel congregation of Louisville, Ky., where he remained two years. In August, 1880, Hirsch went to Chicago, and was installed there as rabbi of the Sinai congregation, an office he still holds (1903). During his ministration a larger house of worship was erected on Indiana avenue (1892). 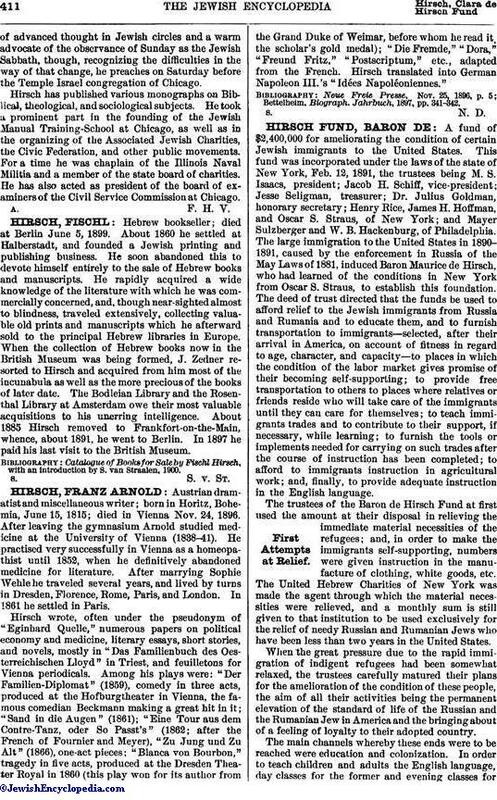 From 1880 to 1883 Hirsch edited with I. S. Moses the "Zeitgeist," published at Milwaukee, Wis.; in 1886 he became coeditor of "The Reformer," issued in New York; and in 1892 he connected himself with "The Reform Advocate," published in Chicago. In 1888 Hirsch was appointed member, and, later, president, of the board of the Chicago Public Library, remaining in office until 1897; it was during his term that the new library building was erected. Since 1892 he has occupied the chair of rabbinical literature and philosophy in the University of Chicago. In 1896 he was presidential elector at large for Illinois. In 1902 he was Percy Turnbull lecturer at Johns Hopkins University, Baltimore, his subject being "Jewish Poetry." Hirsch is an eloquent public speaker and a prolific contributor to Jewish journals. As editor of "The Reform Advocate" he is an acknowledged exponentof advanced thought in Jewish circles and a warm advocate of the observance of Sunday as the Jewish Sabbath, though, recognizing the difficulties in the way of that change, he preaches on Saturday before the Temple Israel congregation of Chicago. Hirsch has published various monographs on Bibical, theological, and sociological subjects. He took a prominent part in the founding of the Jewish Manual Training-School at Chicago, as well as in the organizing of the Associated Jewish Charities, the Civic Federation, and other public movements. For a time he was chaplain of the Illinois Naval Militia and a member of the state board of charities. He has also acted as president of the board of examiners of the Civil Service Commission at Chicago.